Okay, let's admit it; writing words over and over and over and over and over and... (you get the point) just isn't the most exciting way to practice spelling. We want our kiddos to have fun as they learn new words and improve their spelling skills. 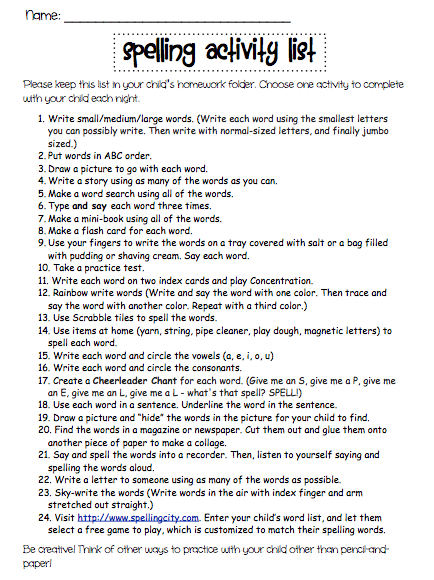 In an attempt to help my students enjoy spelling and word practice at home, I created a "Spelling Activity List" for students to keep in their folders and use at home each night. The students get to choose which activity they complete, and most of the activities move beyond paper-and-pencil practice. If you are interested in using this spelling list with your students, you can grab it for free at The Tally Tales TPT store as the Spelling Activity List *Freebie* product. For a great list of creative, fun, ways to encourage children to practice their spelling words, visit the Mom to 2 Posh Lil Divas blog. This link includes an awesome list of 75 fun ways to practice and learn spelling words. I included a couple of these great ideas on my own spelling activity list, but there are many more described in detail at this blog.